A well-trained dog is an essential if you’re planning on having a companion that is a working dog, a sporting dog, or a service dog. It’s not even a bad thing to have a well-trained dog if all you want is a great family companion. There are as many different methods of dog training and devices to aid you in it as there are breeds of dog. Choosing the right dog training collar is an important decision which will depend on what you hope to achieve with your dog and what you’d like to spend, as well as what kind of temperament your dog has. Different collars will work for different breeds of dog, and also make you as an owner feel comfortable that the collar you choose isn’t painful or reinforcing the wrong behaviors. Sport DOG offers up this Field Trainer as the perfect solution for training your dog in the yard, or field. The company markets themselves as being obsessed with dogs and hunting as much as their customers. This particular model, the SD-425, utilizes the most advanced technology available in the industry and packaged it in a lightweight and compact system. 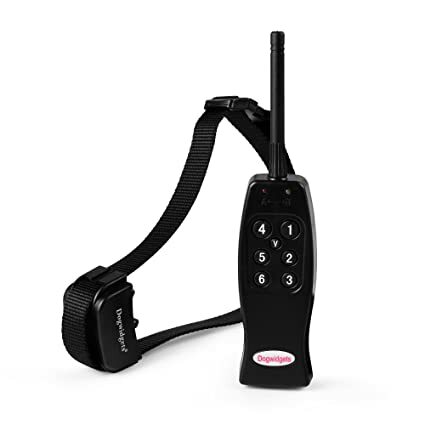 The SD-425 remote trainer is designed to help you keep your dogs in control in the yard or out in the field. 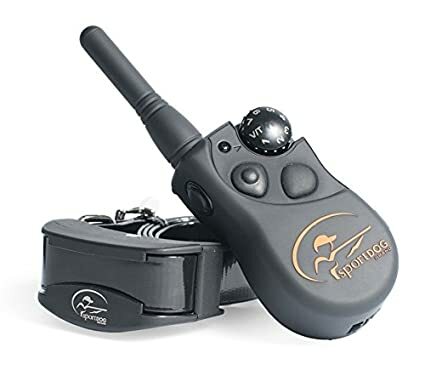 The trainer covers an impressive 500-yard range and allows you to expand the unit to three dogs with the purchase of two additional SDR-AF collars, making this training tool ideal for your entire pack. The collars are only appropriate for dogs that weight eight pounds or more, however. The unit is stylish and small enough to fit in your pocket, with the features you might have thought to add yourself. Both the receiver and the collar are waterproof and can survive being submerged in water up to 25 feet. You will not be worried when your bird dog begins a little pleasure swim. Rechargeable batteries are economical for you and save on waste and costs after purchase. The transmitter offers you control with seven different modes of stimulation. Choose from vibration, or tone, and then pick the correct frequency for your dog to get their attention. You may choose stimulation that is momentary or continuous depending on what behavior you are trying to correct. Included with your purchase of this unit you will receive a basic training manual and DVD which may help if you don’t have experience training a dog for the field. Depending on the breed of dog you have and what your expectations are, you may be interested in experimenting between different modes of stimulation to help you both adjust to the trainer. Owners commonly complain about activities such as excessive barking, pulling on the leash, and stealing food from the table. You can help your dog understand what is acceptable by first offering a warning tone and then moving onto a light shock. With many dogs after some simple use, the tone will be all they will need to be able to mind your instructions more easily. In the field or working on hunting, the collar can be very useful to teach your dog when to stay and not run off. That translates to everyday life as well, as many dog-owners are concerned about their dog running away into the street. This behavior can be difficult to address with some behavioral techniques. The SD-425 offers a humane yet direct instruction to your dog that could help keep you both safe in an otherwise dangerous situation. The rechargeable battery on this unit takes about two hours to charge and will last between 3-5 days once charged, allowing you flexibility for use even while on a hunting trip or traveling. The collar is black and lightweight. Though this unit has all the capabilities and functions needed for training sports-dogs, it works equally well for any puppy or dog that needs to adjust to some rules you have in place at home. It’s important to remember that your dog must have a basic understanding of obedience, and to use the collar as directed. Sport Dog’s customer service team is excellent should you have concerns about the battery, collar, or transmitter. For any stubborn dog that needs some extra reinforcement, or for helping a sporting dog understand what you need out in the field, the Sport Dog SD-425 is a fantastic model. It is not inexpensive, so its best to think of this collar as an investment in your dog’s training and safety. It’s priced at around $170 on Amazon. The Anpro training collar offers incredible technology at a reasonable price. With a 330 yard range and a water resistant collar receiver and transmitter, it is an exceptional value for your money at only $33 dollars on Amazon. This collar features a rechargeable battery to save you the hassle of replacing batteries. So that you are not charging it constantly, it also comes with a handy power saving feature that powers the unit off when not needed. With a long range of 330 yards, this could be a great option for training a working or sporting dog out in the field. The range is sufficiently large enough to allow you some distance and see how your dog responds to your cues. However the unit only claims to be water resistant, not water proof. Therefore this is not the unit to buy if you have a water-loving dog or live in an environment with a lot of water. The collar and transmitter will do fine in a light drizzle but are not intended to be submerged. 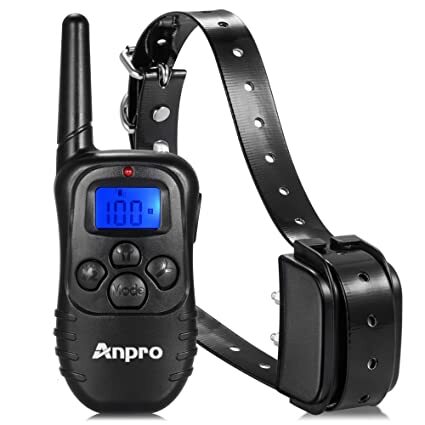 The Anpro remote training collar is designed for dogs from 15-100 pounds with collar sizes from 7-27. It’s important to check your dogs neck for any prior injuries before placing the collar and prongs on your dog. Continue brushing your dog and checking under the collar daily to make sure they are not experiencing any discomfort with training. It’s important with this collar in particular to pay close attention to the fit of the collar. According to Anpro, “A collar worn for too long of made too tight on the pet’s neck may cause skin damage.” While there are millions of dogs that are perfectly comfortable wearing metal contacts, some will be more sensitive and feel discomfort if the collar is ill-fitting. Anpro designed this particular collar for concerns you might have with your domestic pet, as opposed to something you’d experience with a service dog or working dog. It is a great choice if you are trying to correct accidents in the house, biting, jumping up, chasing cars, or barking. For you to have a long-lasting happy relationship with your pet, you need to be able to communicate that these behaviors are wrong. The Anpro successfully helps you communicate when you are unhappy with your dogs behavior with four different modes of operation. Using the handheld transmitter you can select from 100 varying levels of either static shock or vibration stimulation. Many owners find that this range of stimulation provides an appropriate reminder for their dog. In fact, for many breeds the shock settings are not even necessary as dogs respond to a far lesser vibration. There is also a light feature on the collar, or a beep. In receptive dogs, it is rare that higher levels of shock stimulation will be necessary more than once or twice if at all. The handheld unit itself is well designed and easy to read, thanks to the LCD screen. It’s a large screen for the size of the entire unit, and backlit for your ease of viewing in low light conditions. You will not mind carrying this small transmitter with you to help you communicate with your dog. The Dogwidgets DW-3 is the bronze pick for best training collar. It has an option for a one dog set for $39.99 or a two dog set for $64.99 on Amazon. This collar is designed humanely and safely, and simply a vibration is all that is required to correct your dog’s bad behavior the majority of the time. The customer service as Dogwidgets prides itself on being extremely responsive, and this unit also comes with a six month replacement warranty. You can feel confident about your purchase with the dependable guarantee. The DW-3 fits any dog between 15 and 100 pounds and has a fully adjustable collar that goes from 12-30 inches long. As with other collars, proper fit is important to maintain your dog’s comfort during training. Instead of offering hundreds of different settings like some other collars, the Dogwidgets collar has seven different buttons that variate between vibrations and shocks. This eliminates the need to toggle between options or switch buttons. Dogwidgets states that a strong vibration, as opposed to a shock, will stop your dog’s bad behavior 99% of the time. With only seven options for shock and vibration, the small button in the middle of the transmitter console is the vibrate button. The number one button controls a one-second shock, two a two-second shock, and three a three-second shock. Buttons four, five, and six deliver a split second shock, double shock, and triple shock. Again, Dogwidgets is confident in their product and believe that the strong vibration will work with the majority of behavioral issues, so always try that before going to a stronger setting. Consult a training manual to make sure you have a full understanding of training techniques. With an impressive 600 foot range, this collar might work for a variety of different training techniques and will help you keep tabs on your dog even when they are running quite far away. The collar is durable and has an on/off button. The entire set contains a 9 volt battery operated remote, a rechargeable collar receiver, the collar, and wall charger, and the prongs which come in short and long. The longer prongs are meant for dogs with longer hair. 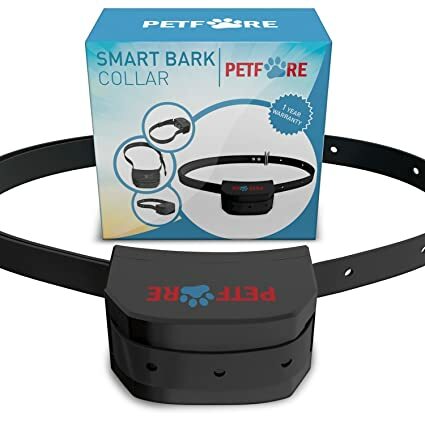 This particular training collar is meant primarily for those having trouble with their dogs behavior at home or close by. Satisfied customers report correcting behaviors like climbing on furniture, jumping on guests, and barking endlessly in the backyard at passerby. One downside of this collar might be that it is not waterproof. Those this feature will not be a consideration for some dog owners, for others that have bird dogs, it may be hard to keep their dogs out of the water while wearing the collar. Though some customer reviews have stated their collars did fine getting slightly wet or left in the rain, it’s probably best not to deliberately try to submerge it in water or leave it on a dog who will head straight to water. In all, for the cost, this is a very humane and effective training collar and having an option for two dogs makes it all the more functional. The Bark Solution Bark Collar is, as you might expect, designed for dogs that have problems with excessive barking. It’s a bargain solution if that is your problem, coming it at just about $26 on Amazon. Many dog owners report that excessive barking is among their top concerns with their dog. The Bark Solutions collar markets itself as the best collar to address that particular problem of excessive barking. It’s easy on your pocketbook and said to be completely harmless for your dog. Bark Solutions does not recommend it being used for puppies, particularly those under eight pounds. If you need to address barking in a small puppy you may want to utilize the collar with the supervision of a professional dog trainer. The collar is recommended for dogs between 15-120 pounds. It features a harmless warning sound and then shock to your dog whenever they bark. These stimulations continue through seven correction levels until the dog stops barking. To protect your dog, the collar stops working for one minute to protect them should barking continue. It’s important to remember that barking is not always something that needs to be corrected and that using anything but the vibration sensation on the collar is not appropriate until you given proper thought to a training regimen. Since this product specifically markets itself as a correctional tool for excessive barking, it’s important to make a distinction between what is really excessive for your household. In some scenarios that customers have described, their guests were unable to enter into their homes or rooms within their homes because of their dogs aggressive barking. The Bark Collar tool helped their dog to understand who their owner believed was allowed to enter the threshold. In addition, for dogs so excited by visitors that they could not contain their barking, the gentle vibration setting allowed lots of interaction and positive reinforcement without the barking. Another humane aspect of this collar is the gradually progressive increase in sound and shock. Your dog may more easily learn when it is appropriate to bark with these reminders. The microprocessor technology within the collar helps distinguish your dog’s barking from other noises in the environment. This basic kit includes the receiver, operating manual and a six-volt battery which is replaceable. Dogwidgets vouches for their customer service and offers a six month replacement warranty should you find your product defective in any way. Will Your Dog Respond Positively to A Training Collar? There have been many studies conducted to try and determine how and why dogs respond to certain types of training techniques. Generally you could consider that there are both positive-incentive training techniques and then techniques that offer no incentive whatsoever. Different breeds of dog are more receptive to discipline than others, and certain households, particularly those with small children, may need to see quick changes in their dog’s behavior should it become unsafe. Critics of electronic collars often find them to be inappropriate because of the lack of human and positive reinforcement after a dog does display good behavior. By properly learning about training your dog, which is a must before you even consider this kind of training device, you will be setting yourself and your beloved pet up for a much happier lifetime together. What Kind of Environment Do You and Your Dog Live In? The landscape and environment you and your dog live on is one of the top considerations you should ponder before purchasing an electronic dog training collar. If you have any water, or a pool, on your property, it would be highly advisable to not go for something that is simply water resistant. Consider the range you really need your dog to be trained at. For those in the country, the longer range is usually better. A training collar alone is not a good tool for setting up a perimeter around your property to keep your dog on. These training collars are meant for an attentive owner to provide their dog with feedback on their behavior in a variety of situations on the land you both share as home. Consider a larger perimeter-based training system if you are looking to provide a virtual fence for your pet. Should You Hire A Professional Trainer When You Get a Training Collar? There are many different ways to train a dog. Professional trainers have multiple different hooks and will appeal to you and your dog in many different ways. There is a difference between positive reinforcement and punishment. There is also a very large difference between misusing an item like an e-collar, and using it appropriately. Uniformly, it is agreed that the primary function of an e-collar is to warn, not to punish, your dog. Therefore should you need any instruction, it is highly advisable and morally appropriate to study some training techniques if you do not want to invest in a professional dog trainer. It is never ok to punish your dog with abuse of an e-collar or any other training device that might inflict pain or suffering upon your pet. Consider your own bandwidth when training your pet, and if you do not feel you have the proper knowledge to use an e-collar humanely either discontinue its use or consult a professional. What Are You Training Your Dog To Do? Dogs love to help humans work. Ingrained in our special relationship is an essence of knowing how to help and foster trust between us. A training collar can be a useful tool when helping your sporting dog understand boundaries and how best to assist you while hunting. It’s equally important to consider the quality of the training collar your purchase should you be pursuing hunting or tracking with your dog. Invest in something durable, waterproof, and with a long-lasting battery. On the other hand, should you be looking to help correct some behavioral problems around the house, you may not need to invest the big dollars in something with an extra long range and water-proof capability. It is likely that for household problems, a simpler collar, still used with extreme caution and with a humane training approach, will be just as effective as something more expensive. Making the decision to purchase a training collar may have been something you as a dog parent have considered for a while, or an idea you just heard of and are eager to explore. It is wise to take the time to examine your dog’s approach to training technique, and come up with a well-crafted plan when investing in something like a training collar. E-collars can be a fantastic asset in training dogs, but they can also be mis-used and over-used. It is extremely important to notice that every single one of our picks for best training collar specify themselves that the higher shock functions should almost never be employed on their devices. The beauty and effectiveness of an e-collar is that the dog should respond to a simple vibration as opposed to a drastic shock, no matter what behavior needs to be corrected. Should you find that this is not the case, consult a qualified dog training professional.